Honestly, I feel bad for EZ Take Out. I feel as though it goes unnoticed, unappreciated, and sometimes disliked. And it saddens me. EZ Take Out is one of Orange County’s best fast food burger stops, yet very few have been, let-alone heard of the place… Well I’m here to get the message out! And I’ll answer your qualms right now, real quick: Yes, it’s similar to In-N-Out’s ingredients with a McDonalds greasiness to it; Yes, the fries resemble the taste of McDonalds, while having the presentation like In-N-Out. And Yes, it’s BOMB. If you haven’t been, and haven’t been naively turned-off to the idea of tasting this burger, it is a must-have… Yeah, I didn’t say “must-try”, I said, “must-have”. The first bite, oh man that first bite. Filled with tons of diced grilled onions along with the first taste of their secret-thousand-island-based-sauce, you’re mouth instantly tastes heaven. The double cheese was so gooey, and so melted, that when infused with the double ground beef paties, it made for the most delightful treat. And let’s not forget about those bright red tomatoes and lettuce… Oh-Wee, when they came in the mix; adding their usual fresh-crispiness, the secret sauce stepped up it’s game and hit it’s stride. All of this goodness was finished up by a toasted bun, graciously holding this prophetic meal together. 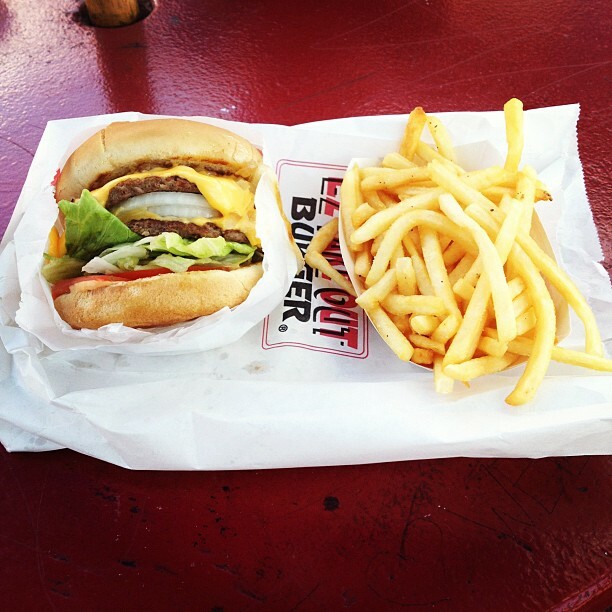 And oh, the fries… Good as always. This past time, they were less crispy than I would’ve liked; However, they were salted to perfection. Oh, what do I mean by ‘salted to perfection’? I mean that after I will have finished writing this sentence, someone should probably call and ambulance, because I’m probably having a heart-attack. (Outside, not drive-through) Anyway, the service… Bad. To be quite honest, it was really terrible. I couldn’t understand anything he was saying… He kept mumbling and he kept his voice was so low that it was almost impossible to hear anything he was attempting to convey over the noise from the kitchen-fan. The worst part of it, was that as I noticed him giving me a “really”-reaction when I asked for a cup of water, I also happened to notice he was the manager. That’s just bad business to tell you the truth. Although I’m willing to “endure” bad service for the sake of a worthy burger, most aren’t. And you are losing money, plain and simple. EZ Take Out, Costa Mesa, if you’re reading this, step up your customer service game. Thus, retaining it’s current position at #18 on THE Burger List, EZ Take Out also keeps it’s #4 ranking on the $10 & Under List. Note: Actual ranking is subject to change when new burgers make the list. Also, the percentage score will not reflect the burgers’ ranking on the list, for each burger is unique and must be graded on it’s own merits. For up-to-date rankings, check THE OC Burger List in the menu! Thanks. Think the Costa Mesa store moved or went out of business. Was driving by for some Mongolian BBQ and I noticed the sign had changed. You should review the new place and see if it’s up to snuff. That’s insane… I just went there less than 2 weeks ago. I will say that the burger and fries I received weren’t up to par. Thanks for the tip! And I’ll definitely have to check it out, you should come with!